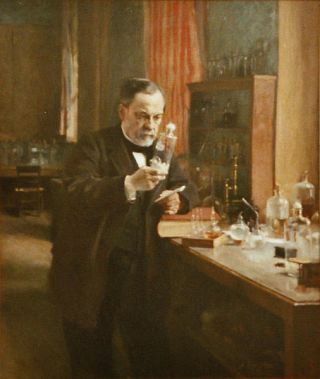 Louis Pasteur in his laboratory. Painting by Albert Edelfeldt (1885). Meat leftout too long will eventually bear maggots or mold.? These days we know themaggots hatch from fly eggs and the mold grows from spores that were carried inthe air, but in the past the fuzzy growth and wriggling white bodies were proofthat whole organisms could spontaneously arise from rotten meat or certain othertypes of inanimate matter.? In theearly 1860s, the French chemist Louis Pasteur proved that such ?spontaneousgeneration? did not occur, but instead the air itself was full of bacteria,spores, and otherforms of reproducing life. Across the Channel, in 1859, Charles Darwinpublished ?On the Origin of Species,? which promoted the notion that life formswere ever-changing, evolving into new species over the eons.? Pasteur?sexperiments and Darwin?s theory led to opposing conclusions regarding theorigin of life on Earth. Pasteur claimed that his work lent support to thebelief that God created life. Just as life could not arise spontaneously frominanimate matter, the first life on the early Earth could not have arisen withoutthe aid of a divine creator. Yet Darwin?s theory of life evolving over time impliedthat the first life on Earth could have evolved naturally from inanimate matter. Toward theend of the 19th century and the beginning of the 20th century, as scientists werelearning about the genetic and biochemical complexity of the cell, confusionabout the origin of life grew.? One way around the problem was to say that lifehad never emerged, but that it had always been an inherent part of theuniverse. ?? ?The universeand matter were regarded then as eternal,? says Iris Fry, a historian ofbiology at the Israel Institute of Technology and author of ?The Emergence ofLife on Earth: A Historical and Scientific Overview.?? ?Life was also claimedto be eternal. Life always existed and didn?t have to arise from matter. Inthis way, the problem of the origin of life was explained away.? Fry pointsto scientists such as Hermann von Helmholtz in Germany, Lord Kelvin in England, and Svante Arrhenius in Sweden,who promoted the idea of sperms of life wandering the universe and taking rootin any planet with the appropriate conditions. This idea of the seeds of lifebeing everywhere became known as thePanspermia hypothesis (?pan? being the Latin root meaning ?all?). Helmholtz,Kelvin, and others suggested that life traveled to planets within meteorites.Arrhenius and others claimed that seeds of life, protected as spores, could bepushed toward planets by solar radiation.? Fry saysthat the current usage of the term ?Panspermia? ignores the history of ideas onthe origin of life and the specific meaning of this term. ?Certainlyscientists today do not believe that the universe is eternal, they do notbelieve that life is eternal,? says Fry. ?The cosmology changed. People beganto realize that the universe had a beginning and that it was expanding, so thiswhole idea of eternity lost ground.? Fry saysthat the notion of eternity was used in the past to promote a philosophy thatlife and matter were separate unbridgeable entities. However, most scientiststoday agree that life arose from non-living matter. ?Scientistswho believe that life might have arrived on Earth from space by meteorites orcomets do not doubt that this life emerged from matter at a certain point in timeon another planet,? says Fry. The term?Transpermia? is used now by several scientists to describe the transfer oflife from planet to planet. Fry prefers this usage of Transpermia to Panspermiabecause it avoids the confusion with the old meaning. Some scientistswho study organic molecules in space have used the term Panspermia to describethe delivery of these molecules to planets like Earth. ?This is neitherPanspermia nor Transpermia, because it is not the transport of life, but justthe transport of what might have served as the building blocks for life,? saysFry. While many ofthe molecules important for life have been detected in space, and meteoritesand comets possibly could contain life itself, that doesn?t necessarily meanlife came to Earth from space.? While some experiments suggest the transfer oflife from one planet to another is theoretically possible, life would have to endurequite a lot to get here. The conditions in space are extremely hostile toEarth-based life, which tends to die when exposed to an airless vacuum and extremesof temperature and radiation.? Also,Earth?s atmosphere acts as a barrier to life falling in from space. Recent tests conducted by Europeanscientists have found that microbial life can not survive the fiery conditionsof atmospheric entry. Some scientists even question whether organic materialdelivered by comets and meteorites was necessary for life?s origin, since theearly Earth may have had plenty of organic material of itsown. As for whatshe believes, Fry says it is an open question whether or not lifecame to Earth from space.? ?When theEarth formed, the solar system was undergoing this accretion process, and therewas exchange of material between the planets, the heavy bombardment periodwhere asteroids hit the Earth,? she notes. ?It could well have been that lifestarted on Mars, for instance, and then reached Earth. Still, even though it?sa possibility, I don?t see why life couldn?t have started here.? ?